Veg Dining Part 2: The List. Hidden Non-Veg Ingredients. Looks can be deceiving. Especially when it comes to food. Exhibit A: My California Avo-Cheese Sandwich. Is that Mayonnaise or Vegenaise? 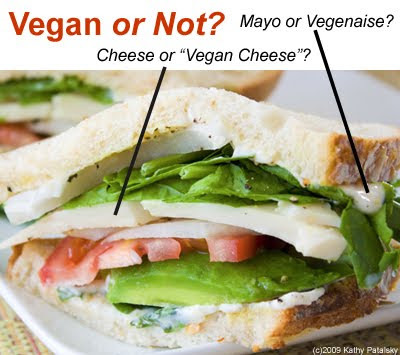 Cheese or Vegan Cheese? Hard to tell. 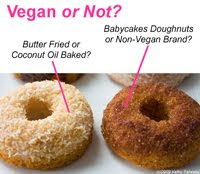 All you know is one is vegan and the other is not. It's up to you to "fight for your food." It's your food, claim it, eat it and enjoy it. Vegan Food is Served! Oh wait, maybe Not. Butter on my veggies, sour cream in my guacamole and fish oil on my asparagus? Yikes. There is a frightening fun house of 'hidden' non-vegan ingredients that you may find in your 'vegan food'. Your only line of defense: Education and Communication. Educate yourself (reading this post will help) and communicate with your waiter and the restaurant staff. I can't personally argue with your waiter over a kitchen error inflicted upon your food (even though I've unintentionally become an expert at doing just that), but I can help to educate you. "Is it Vegan?" 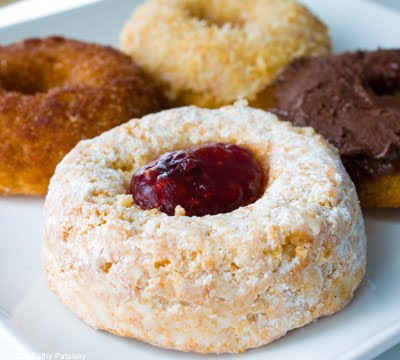 Exhibit B: Babycakes' Doughnuts. Impossible to tell that they are vegan at first glance. For Your Veg*n Eating Pleasure: The list. Also ahead, at the end of this post are a few 'bad dining experience' tweets I received from my twitter friends. The List. Here is my list of a few items you must look out for when dining out. I asked friends, chefs, foodies and my twitter friends for a few ideas of what to look out for. These are also foods and ingredients that I have come across when trying to dine out vegan. 1. Chicken Broth, Beef Broth and Fish Stock. Soups, even veggie soups are often made with non-veg stocks. You have to ask. In Asian cuisines, mushroom or miso stock is the preferred stock in vegan soups. Make sure your broth is a vegetable based broth. Non-veggie broths may also be added and absorbed into rice dishes and bean dishes, so again always double check if you have concern. Butter is my nemesis. Too many times I have ordered the 'vegan' item on the menu and it comes back doused in butter. Sauteed veggies, rice, mashed potatoes and grilled anything are common offenders. Sometimes, even saying 'no dairy' doesn't help. For whatever reason, waiters and even chefs forget that butter is dairy. Butter may be used on grills, in saute pans and often times to cook veggies. I'll never forget the very expensive 'veggie platter' I ordered off a Christmas Eve menu. The waiter was certain that the dish would be vegan (I mean it was all vegetables), but one bite and clearly the entire plate of veggies was cooked in butter instead of olive oil. And the worst part is when you have to explain to your waiter that they were wrong. I'm sorry, but butter is not vegan and my veggie plate is covered in butter. Obvious problem ingredient. But actually, cheese is the easiest ingredients to leave off. Most pizza places have no problem making you a pizza with no cheese. However, watch out for some pizza crusts and breads that have the cheese baked in. Some fancy flat breads may have cheese sprinkled into the dough-even if you order it no cheese on top. Cheese may also be found in veggie soups, rice and pasta dishes. No cheese please is so easy to say with a smile. One note: if you are ordering a pricey cheese-topped salad with 'no cheese' you might want to ask if you can order off the menu and just get the veggies. You don't want to be paying say, $16 for a beet and cheese salad (with no cheese) when the cheese is the most expensive part. A chef friend of mine gave me this good 'hidden ingredient'. Sour Cream! He said that it is often times blended into a lot of dishes, especially in Mexican cuisine. It is easy to leave the sour cream off a burrito or fajita plate, but make sure your beans, veggies and even guacamole are sour cream free. Sour cream may also be mashed into potatoes or blended into dips and dressings. Fish oil is often used as a flavor enhancer for soups, sautes and vegetable side dishes. Sometimes it's not listed on the menu as a flavor accent ('fish oil' isn't the most glamorous-sounding of ingredients). Ask for only veggie oils like EVOO and canola to be used on your precious veggies. Also, fish oil is rich in omega fatty acids and thus can be added to certain grocery store foods and juices. A few tweeters mentioned that they accidentally drank orange juice fortified with fish oil. When ordering veggie sushi, always make sure to say 'no bonito'. I've had more than a few incidences where bonito was sprinkled on top of my veggie sushi rolls. Nothing sadder than beautiful rolls doused in bonito flakes. Bonito may also be added to soups and noodle dishes. This happens more often that I'd expect. I'll order something that contains a mix of veggies and there will be a mysterious chunk of meat in it. If you aren't familiar with the restaurant make sure to ask if the veggies are kept separate from all animal products-specifically big chunks of meat! The other night I was dining out at a 'fancy' place when the waiter made this statement "Well yeah, ALL pasta has eggs in it." He looked at me like I was nuts for asking if they had any egg-free pasta available. Yes, most fresh pasta has eggs in it, but most dried pasta you buy at the store is egg free. If your waiter insists that all the pasta 'has eggs' ask him to kindly ask the chef about options. I dined at Le Bernardin in NYC and had some of the best vegan pasta I have ever eaten. True, it was not the fresh egg-containing pasta as shown on the menu, but mine was a special egg-free variety. A good restaurant will always have an egg-free option. Eggs can also be found in certain Asian dishes like Pad Thai. You can hopefully just say 'no egg'. But double check. Eggs are also often found in 'veggie burgers' as the binding ingredient. Make sure your veggie burger is cheese and egg free! Milk is dairy. Easy enough right? Wrong. Dairy milk comes in many forms and names. Dairy is often hidden behind names like 'casein' 'whey' and 'lactose'. There are many 'soy' products out there that are not really dairy-free. Soy cheese, soy yogurt and soy burgers may all contain casein - which makes them dairy products. Which to me, makes the "soy" part pretty deceiving. Cream is an ingredient adored by French chefs. Butter as well. Probably why I avoid all mainstream French cuisine. Sad because French trained chefs are Kitchen-God rockstars to foodies like me. Examples: Julia Child, Alain Ducasse and Daniel Boulud. Cream is used in many veggie soups and sometimes risotto. "Cream of (insert vegetable here)" may sound veg, but it's not vegan. Casein gets its spot on this list because it is such a big problem in the food service industry right now. "Soy cheese" is often marketed as a dairy-free alternative to traditional cheese. But if you look closely you will find that it is not vegan and contains casein, aka dairy. Some restaurants or pizza places will start offering 'soy cheese' without realizing that the cheese contains casein and is not vegan or dairy-free. If you haven't read the QuarryGirl.com study called "Operation Pancake", you should. It was an undercover study that showed how several LA area restaurants lied (knowingly or not) about whether or not their 'vegan menu items' contained casein or egg. It's shocking to see what the study uncovered. And FYI, there are plenty of vegan cheeses on the market that rock my pizza's world: "Follow Your Heart" and "Daiya" brands are two delicious examples. As a Mexican food addict, I hate to think of this, but lard is used in some Mexican foods like beans and even tortillas. Ask, ask, ask. Bacon cupcakes, bacon martinis, I've seen it all. Just please keep the bacon out of my veggies. Bacon and other pork bits have a lot of intense flavor - thus they are an easy flavor enhancer for veggie menu items. It's like fine dining's version of bacon bits. Make sure there are no bacon bits anywhere near your green beans. Many forms of dark chocolate are in fact vegan, but you have to look out for 'chocolate' in menu items because they may be using milk chocolate or dark chocolate that contains whey or other dairy ingredients. So this gets pretty nit-picky compared to a chunk of beef in your veggies, but sometimes bagels and breads that are 'vegan' will be brushed with an egg wash. Some bagels simply use a water wash to apply the seeds and bagel toppings, but if the top looks 'extra shiny' it probably contains eggs. You can always ask. I was thrilled when I found out that NYC's H and H bagels were water brushed. No eggs. Yay. Also, egg yolks and hard boiled egg bits can often be emulsified into dressings and sauces. I was once given a dressing that seemed oddly creamy. My waiter said "No cheese or dairy in it." I said, "Well why is it so creamy?" He said the chef used shallots and hard boiled egg bits to thicken it. A dairy-free dressing doesn't always mean it's vegan. 15. Micro Ingredients: Gelatin, Whey, Food Colorings. Sometimes just a dash of something un-vegan is used in a recipe. Gelatin, which is not vegetarian, is commonly used as a thickener in foods like pudding. Whey powder is easily sprinkled into recipes and because it doesn't look like milk, an inexperienced sous chef or waiter might forget that it contains dairy. Very bad. Some food colorings are not vegetarian. No to gross you out, but one commonly known red animal dye is: "CARMINE: Cochineal. Carminic Acid. E120. Red pigment from the crushed female cochineal insect. Reportedly 70,000 beetles may be killed to produce one pound of this red dye." Hold the Mayo. Mayonnaise contains both milk and egg ingredients. And why would anyone choose traditional mayo when they can have delicious cravable Vegenaise. So good and oh so vegan. This one is for the vegans who can't seem to get a sweet break. It's incredibly easy for seemingly vegan food items from nut butters, mustard's and wheat bread to chai teas, dressings and granola bars to contain honey. I know many 'Bee-gan' vegans who aren't picky about honey, but if you don't eat honey, you'd better be very diligent about asking how foods are sweetened. Some wine and beer products is not vegan. The highly popular Guinness beer is not vegan. They use an animal product agent in the processing of their beer. Corona beer is. I basically stick with organic and biodynamic brands. And I'm actually more of a wine, champagne and sangria drinker myself. But if you are worried about your alcohol, there's a few great resources online. I did a post on vegan and non-vegan beer here. Anything to add? Please comment it or email me-I'd love to build this list even more.